On February 9, former Secretary of State George Schultz proposed decriminalizing drugs as a strategy superior to prohibition. Specifically, he argued that young peoples’ fear of arrest for using drugs such as marijuana deters them from seeking treatment. The facts are to the contrary. Arrests for drug use are in fact statistically rare (about one arrest for every 34,000 marijuana joints smoked), while incarceration for drug use is even more rare. As the RAND Corporation has argued, “in no Western country is a user at much risk of being criminally penalized for using marijuana.” The argument holds for use of other illicit drugs, as well. In fact, decriminalization decreases the incentives for people to seek and achieve recovery because the criminal justice system, operating through drug courts, is a leading means of getting drug users into treatment as an alternative to incarceration. Decriminalization, perversely, removes the motive and the very instrumentality of achieving sanctioned, supervised drug treatment. Mr. Schultz also stressed the need to improve youth prevention efforts, without acknowledging that decriminalization makes prevention harder. Youth perception of risk in using drugs (marijuana in particular) is widely known to be a major component of successful prevention efforts. In the age of “legal” marijuana, perception of risk has now plummeted to the lowest levels ever measured, a fact that the White House itself attributes to legalization efforts. Finally, Mr. Schultz decries the criminal drug trade, known for violence and corruption. But again, he fails to address the clear evidence coming out of Colorado showing that the criminal black market (including transnational cartels) is thriving under legalization, not withering away. Not only are criminals providing illicit drugs to youth, Colorado is now a source of nationwide smuggling operations moving high-potency dope to all states. This fact is the heart of the matter: decriminalization puts communities at risk and delivers none of the promised advantages, as reported by both law enforcement and the news media. Following Mr. Schultz’s piece, the Journal ran a series of letters, often containing more erroneous claims offered in support of decriminalization. For instance, one letter posited the argument that, as a function of drug prohibition, we have built “a vast bureaucracy” comprised of such entities as “prison guard unions,” who “ride the gravy train of prohibition and fight tooth and nail” against marijuana legalization, out of self-interest. This hardly seems plausible, given the reality that in the state prison system, holding the majority of prisoners, less than one-half of one percent of inmates had marijuana use or possession as their primary criminal offense, with most of these inmates having pled down from more serious criminal charges. Insisting on continued laws against marijuana hardly seems the basis for extending a career in guarding prison inmates. Yet that claim is obviously false. Data from the Centers for Disease Control and New Jersey law enforcement show heroin overdose deaths increased 155 percent over the last four years, notwithstanding that the New Jersey marijuana dispensary program began in 2010. Moreover, the most recent findings published in the Journal of the American Medical Association/Psychiatry re-confirm that marijuana use steeply increases the risk of subsequent use of, and dependency on, additional drugs such as heroin. Should Economists Wage the Drug War? On February 19, the Journal‘s “Saturday Review” section featured, “How Economists Would Wage the War on Drugs” by Tom Wainwright of the Economist magazine. This piece, too, rested on errors and distortions. As evidence of our supposed policy failures, we are told that the number of people using cannabis has increased by half since 1998. This is highly misleading. The actual trajectory of cannabis use in the U.S., as shown by the only continuous nationwide survey for the period, has been a compound curve of steep decreases between 1979 and 1992, then a rise, doubling between 1992 and 1997, followed by another decline from 2001 until 2008. Subsequently, the rates begin to rise again into our current situation, where cannabis use has indeed sharply increased, but only during the time of this Administration, dating from 2009. Wainwright also omits the role of drug supply in the discussion and fails to mention that the recent rise in marijuana use and legalization also coincides with the historically steep ascent of heroin use and overdose deaths, beginning in 2010 and still rising, unabated, in 2015. 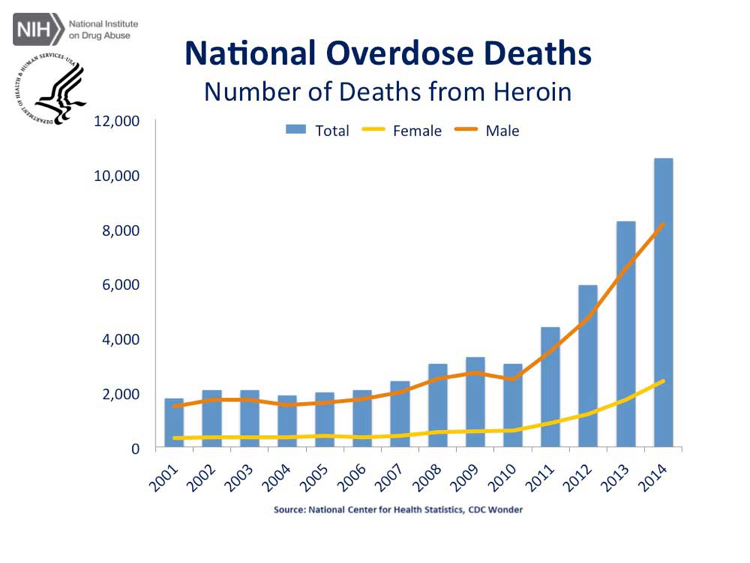 Further, the heroin overdose rates have risen in lockstep with the enormous explosion of heroin production from our primary source, Mexico. Wainwright ignores that this sequence of drug use declines and ascents is precisely bracketed by successive administrations, and directly correlates with the implementation of effective drug supply reduction programs, only to be followed by their explicit abandonment. Such is hardly an argument that supply reduction does not work; rather, it shows what happens when such programs are dismissed. Wainwright’s policy solution calls for turning from effective supply control in favor of public health strategies emphasizing treatment and prevention. This solution ignores well-documented history. Treatment and prevention had been key components of bipartisan and balanced drug control strategies in the two decades prior to the Obama Administration. The radical change Wainwright is calling for in our nation’s drug policy has been implemented in the explicit de-emphasis of supply control during the Obama Administration. It is through this very policy experiment that the current crisis exploded. We have already seen the results of Wainwright’s approach, and perversely, it is a key cause of the crisis he is seeking to solve. To prove his misguided thesis, Wainwright misstates the results from Colombia. Despite eradication in Colombia, we are told, “the price of cocaine in the U.S. has hardly budged … for most of the past 20 years.” This is false. Under the partnership of Presidents Bush and Uribe, and fulfilling a program begun under President Clinton, Colombian cocaine production dropped fully 75 percent under the impact of eradication. Such a drop enabled major changes in Colombian life, fostering advances in human rights, in economic investment, and extension of the rule of law, as it enabled effective alternative development objectives to take hold. The positive impact was not restricted to Colombia. Seizure data from the Drug Enforcement Administration showed steep declines in cocaine purity on U.S. streets and correlative increases in price-per-pure-gram. Cocaine consumption in the U.S. fell by half. Cartel revenues declined so precipitously that the effect was felt in Mexico. Cocaine seizures at the U.S. border decreased, a sign of constricted supply. Cocaine overdose deaths declined, as did the need for treatment. Even workplace drug testing results mirrored the steep decline. Between 2007 and 2011, Colombia and the U.S witnessed one of the most dramatic positive drug policy programs in history. Over the last few years, this progress has been undermined and cocaine production is sharply increasing again. As a result, U.S. cocaine overdose deaths are once again rising. A comparable story detailing the importance of drug supply could be told regarding Mexico, though the impact was converse. Since 2009, we have neglected effective engagement with that country’s government. As a result, cartels are strengthening, and heroin production rose a threatening 62 percent between 2013 and 2014 alone, with worse expected once crop surveys are completed for 2015. Cartel revenue from methamphetamine and heroin trafficking are flush, as indicated by sharply increasing border seizures since 2010. As part of the current mismanaged opiate overdose epidemic, more than 10,500 Americans died from heroin overdoses in 2014. And the primary reason is the policy decision not to control the supply and attack the criminal traffickers—that is, we walked away from the “war on drugs,” notwithstanding that our adversaries in the struggle did not. In fact, under marijuana legalization in the states, we are actually abetting the criminal trade in these drugs. Mr. Wainwright further argues, “Where demand cannot be dampened, it can be redirected toward a legal source, as a few U.S. states have done with marijuana—a development that has inflicted bigger losses on the drug cartels than any supply-reduction strategy.” There is no sound evidence of this. Mexican marijuana cultivation remains strong, while the proportion of overall cartel revenue attributable to marijuana is a matter of dispute. More importantly, our knowledge of cartel revenue, which has multiple sources, is insufficiently precise to sustain Wainwright’s conjecture, or to detect a single year of marijuana sales in a handful of states. This same absence of available data sufficient to the task also defeats Wainwright’s fanciful hypothesis that spending on school-based drug education is more effective than all of our considerable investments in Colombia, that ranged from alternative economic development to strengthened institutions of justice and democratic governance. Colombia, at mortal risk, was transformed, and the critical battle had to stagger the narco-terrorists. Unfortunately, “redirecting” demand to a legal source doesn’t stop the consequences of drug use, which include disease and death. Equally important, it does not take the profit out of the drug trade; in fact, cartels are capitalizing on the legal Colorado trade with sophisticated operations serving the growing marijuana prevalence nationwide. We should reduce demand for drugs, but providing a legal source for those drugs is counterproductive. A clear policy lesson in these accounts is that where drug supply is severely constricted, as with Colombian cocaine, the effects will ramify to the benefit of all components of a balanced drug control strategy, including treatment and prevention. Conversely, when drug production and availability surge, as seen with recent Mexican heroin production and now, legal marijuana, the consequences will weaken all policy components. For all the contributions of Mr. Wainwright’s economists, we are left with our initial problems, compounded. How do we teach young people not to use drugs while the law makes it easier and accepted? How do we get more addicts into treatment—overcoming the denial inherent in the disease of addiction—without drug courts? How do we afford the societal and public health costs as we expand use, addiction, and death? There is an important role for a market-based analysis of our efforts, but bias and blindness of the difficult facts make for bad analysis and dangerous public policy.